Plus, the situation seems poised to worsen. According to a UNESCO report, Petén’s population has surged from 25,000 during the 1970s to upwards of 500,000 today. This growth, coupled with an attendant rise in subsistence farming, has had significant environmental impacts across the region. At a 2008 meeting at the Woodrow Wilson Center, professors Justin Brashares and George Wittemyer said three factors drive population growth near protected areas in Africa and Latin America: 1) more money for parks (as measured by protected-area funds from the Global Environment Facility); 2) more park employees; and 3) more deforestation on the edges of protected areas. To avoid population pitfalls, Guatemala’s President Alvaro Colom should take this research into account before putting his “Cuatro Balam” eco-tourism plan into action. The initiative—named for the four main figures in the Mayan creation myth—seeks to divide the reserve into an archaeological park in the north and an agricultural zone in the south, while setting up a Maya studies center for scholars and installing an $8 million electric mini-train to shuttle tourists through the reserve. While President Colom’s plan is certainly ambitious, communities in Petén are cautious. They see Cuatro Balam as a continuation of earlier government-funded projects, where “pristine conservation” – oft-touted by large conservation organizations – prohibited human interaction with the forests and limited socioeconomic opportunities for local populations. Liza Grandia, an anthropology professor at Clark University who has lived and worked in the Peten region, points out in Conservation and Society that “primary” or “pristine” forests flagged as biological hotspots by these conservation organizations are likely remnants of ancient Mayan agroforestry. However, Mayan descendents are not allowed to live within nor manage these areas. Instead, stewardship of many federal parks is delegated to large conservation outfits or the government. But Rosa Maria Chan, director of ProPeten, a community-based environmental organization, wrote in an e-mail to the New Security Beat that “the environment is not always the government’s priority,” adding that “development” normally signifies large infrastructure projects, instead of smaller-scale ideas that would better address human development. One successful local project is the Association of the Forest Community of Péten (ACOFOP), a community-based association made up of 23 indigenous and farming organizations. Under ACOFOP’s direction, uncontrolled settlement in the biosphere reserve has been stopped, communities have ceased the conventional slash-and-burn practices, and forest fires have virtually ceased in community-managed areas. ACOFOP’s projects have also created jobs in local communities, where the beneficiaries re-invest their earnings into collective infrastructure. In the mid-1990s/early 2000s, ProPeten’s Remedios I and II programs, funded mainly by USAID, used radio soap operas and mobile theaters to educate residents about conservation, reproductive health, nutrition, and sustainable agriculture. Underlying these programs’ success was an unprecedented survey that gathered data on the rapidly changing population-environment dynamics in this frontier region. Grandia, who served as head of ProPeten’s board of directors from 2003-2005, writes in 2004 Wilson Center article that “the integrated DHS [Demographic and Health Survey] has been a critical part of developing…programs linking health and population with the environment,” which lowered Petén’s total fertility rate from 6.8 to 5.8 children per woman in just four years. Plans are underway to include a similar environmental module in the next DHS survey. Although the fate of Guatemala’s forests is subject to many outside forces, from the government’s development plans to the cartel’s smuggling operations, small-scale, community-based programs may have the best shot at transforming the drivers of deforestation into sustainable, economic development opportunities. 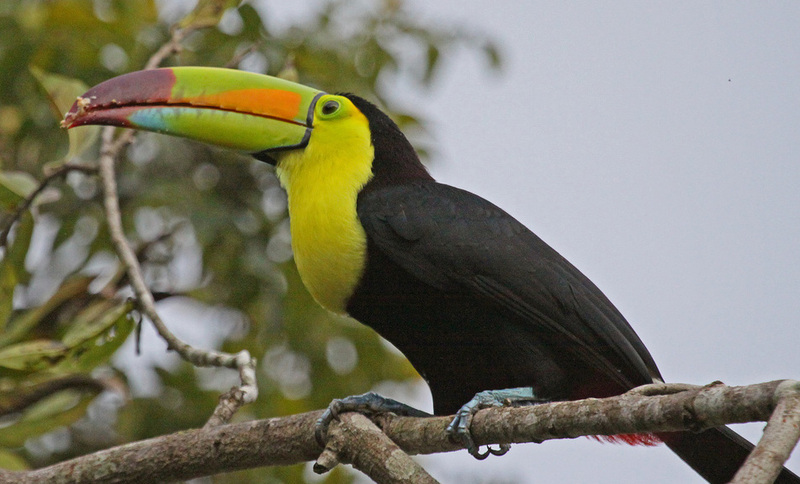 Photo Credit: “Keel-billed Toucan at Tikal National Park, Guatemala,” courtesy of flickr user jerryoldenettel. The population growth that is occurring in the Peten is due to both migration and high fertility rates (despite women's desire to have smaller family size). There is little evidence to implicate protected areas specifically as the driver of this growth. Scarcity of resources in other parts of Guatemala, the remoteness of the Peten and inadequacy of health resources, and the lack of adequate protections for the resources of the park do however contribute to natural population growth, people migrating to the area seeking a livelihood, and increased use of local resources. This article is very interesting and provides insight into what could potentially be a very serious national issue in the near future. The Taliban in Afghanistan conduct the same measures with the local farmers in order to transport and manufacture opium products. The high fertility rates and small subsistence farming will continue to lead to deforestation and potential hunger. I think this issue may potentially be bigger than it sounds.